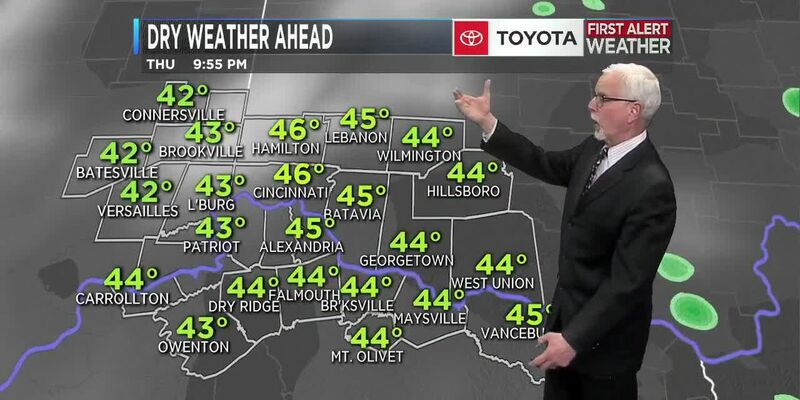 CINCINNATI, OH (FOX19) - Weather forecasting models over the past several days have been consistent in warming the air and keeping it dry for the next week. If this verifies, Opening Day 2019 will fall between the warmest Opening Day at 86 degrees and the coldest at 38 degrees for a nearly ideal day for the Findlay Market Parade and later on for rooting the Reds to victory over the Pirates. Keep your fingers crossed! The sky will not clear as quickly today as models indicated yesterday because of two upper level disturbances that pass over the region with just enough energy and moisture to cause a few isolated showers this morning and again this afternoon. The sky will clear for a sunny Saturday, then clouds will increase Sunday with showers arriving late afternoon or early evening. The light showers will continue into Monday afternoon.